The Metropolitan Museum of Art just held a benefit gala for the new exhibit “China: Through the Looking Glass.” And celebrities showed up wearing meme-inducing clothes. Thanks, famous people! As noted on Chinese sites Zhenren, CRI and Sina, many people online in the country were throughly amused by outfits American celebs wore at the met. But Rihanna’s yellow gown, which was created by a Chinese designer, might have caused the most amusement online in China. The above pizza image was apparently created by Instagram user MichaelMajesty, but is also doing the rounds online in China. 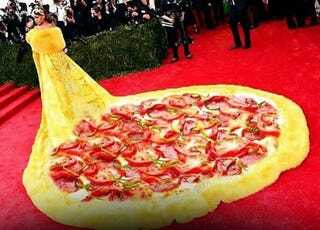 The dress also reminded people of scrambled eggs and jianbing (Chinese crepe). Also, kinda looks like she was wearing skinned Big Bird! Second only to Rihanna was actor Sarah Jessica Parker, who wore this head piece from hat designer to the British royals, Philip Treacy. Online in China, people quickly compared the get-up to the 2008 Beijing Olympics mascot Huanhuan, a character that symbolized the Olympic torch.